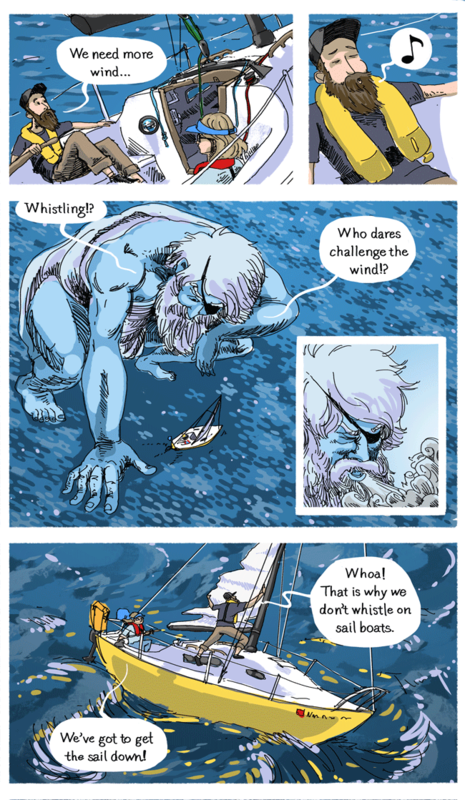 In the previous sailing comic, the one about the rain, we weathered a pretty brutal storm at the dock. Well, this is a half true story about how we came to be at the dockside when the storm kicked up. We were out for a short cruise with friends, when we found the wind not strong enough for our taste. Naturally, being somewhat superstitious as boat folk tend to be, I whistled. As you may have now guessed, it's bad luck to whistle on boats, it's a challenge to the wind. Surely enough just after whistling we saw the first lines of rain blowing towards us. So, if you've ever wondered where the phrase "___ing up a storm" came from, there you go. I often feel although half of our idioms and phrases come from sailing.